I’d rather not say that I’m seeing the light at the end of this long renovation tunnel (for fear of jinxing myself.) But, I definitely have caught a glimpse of the finish line. Last week my kitchen designer emailed me to let me know that my cabinets will be arriving soon and could she schedule us for installation on March 25th? I seriously might have let a four letter word escape my lips as I read her email. I mean, yes I’m happy, but there is no way I feel ready! There’s still so much to get done before the cabinet installation. Up until this past weekend we still had exposed wall studs and wiring. I did have to move the outlet boxes forward so they would lay flush with the drywall after it was installed. To do that, I simply pried the boxes off the stud, then aligned the first line on the box up with the stud. When the nail is hammered in, the box recesses to line up with the second line (because the nails are angled into the wall.) The secured outlet sticks out from the stud just enough to be flush with the drywall. But, because I’m adding a tile backsplash, I moved our boxes out a little further. This was the perfect time to take pictures of the wiring and plumbing pipe locations for reference later. It was also the perfect time to plan ahead for the future. The wall to the right of our sink will have open shelves to hold our everyday dishes. To create a strong foundation to secure the brackets I added blocking between the studs. Insert a time capsule! I taped our Christmas card with pictures of us during demolition and our Christmas letter onto the wall. Then I signed and dated the wall. I’m thinking about the day that some future homeowner finds our little message ;-). I also taped the structural engineer’s drawing into the wall should anyone open it up and wonder why the heck there is a second wall attached to the first. And it was now time to get our drywall game on! There is definitely a science to hanging drywall. But, the most important tip is to sink the screws the right depth. The screws need to recess just below the surface, dimpling but not breaking the paper around it. Above is a perfectly dimpled (recessed) screw. If you go too deep, the drywall won’t hold and could crack inside. The only remedy is to put another screw near the one that’s too deep. Pretty Handsome Guy chipped in to help me hang the sheetrock. Below he’s demonstrating how it is easier to add sheetrock over a doorway instead of cutting the piece to size ahead of time. 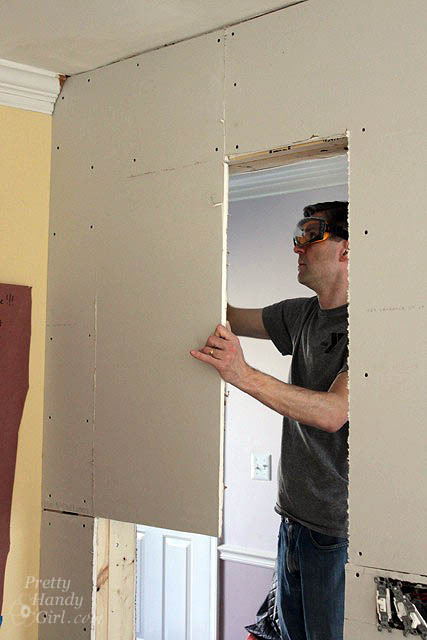 After the drywall is attached, you can cut around the opening with a drywall saw and a utility knife. Be sure to read my tutorial for mudding drywall joints and seams! Unfortunately we couldn’t replicate this technique around the window, so I did my best to cut pieces to fit around it. I honestly don’t think I could have installed that window without his help. It took us all day, because we had to build a support wall and then spent time re-framing out the new opening. The new window isn’t much bigger than the previous window, but it lets in more light and it is easy to open on a breezy spring day. And that makes me happy! I’ve been told that the rest of my tiles are arriving direct from Italy and expected to clear customs in a week or so. I ordered them from TheBuilderDepot.com. After a lot of research (and looking for the perfect tiles for our kitchen), I chose to work with The Builder Depot because they have the best prices and the best customer service! David, my rep from The Builder Depot, has been emailing me with some great ideas for tile designs, and I truly appreciate his expertise. After the kitchen drywall was done, I turned my attention to our cozy window seat. I am currently framing in a back rest and was able to get Pretty Handsome Guy’s help moving the gigantic (and very heavy) MDF sheet to cut out my seat panels. When it is complete, we’ll have storage underneath. We’ve decided that this will be the perfect place to store board games for Family Game Night! Just an FYI, I read that you should never have seams at door/window corners as they will be prone to cracking since doors/window shift over time. Cathie, excellent tip. Thanks for chiming in.